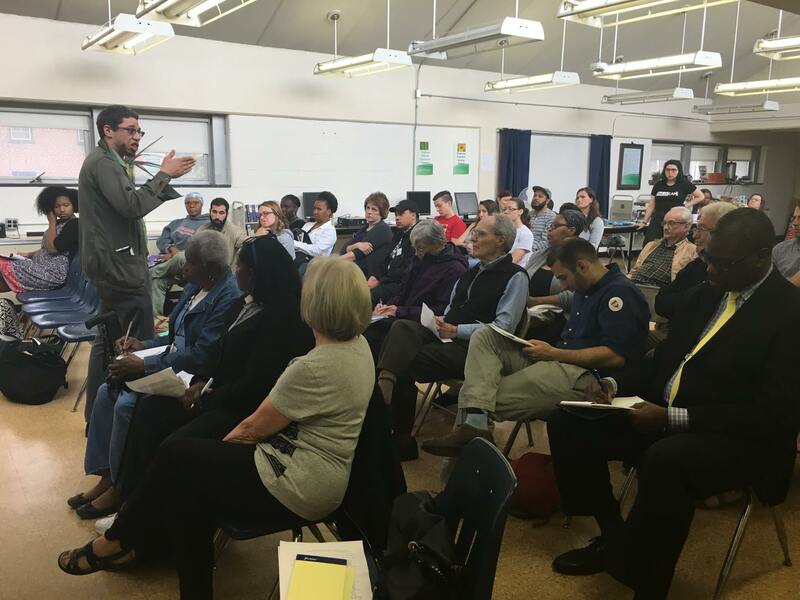 On Wednesday, June 7th, over 60 people came together to demand School Reform Commissioners commit to vote toz abolish the School Reform Commission by Fall 2017. While all 5 Commissioners were invited (and Chairwoman Wilkerson had RSVPed), no Commissioners attended. On Thursday June 15th at the second to last SRC meeting of the year, we will mobilize to demand that the SRC commit to vote to abolish the SRC by the Fall of 2017. ***Please sign up to speak at the SRC meeting by calling 215.400.4180*** You must sign up to speak by June 14th at 4:30PM at the latest, but we highly encourage people to sign up NOW. Please message us or email info@215pa.com once you have signed up to speak so we can coordinate. Studying the laws on how to abolish the SRC, the Our City Our Schools coalition has come up with a critical timeline of how we get our schools back. 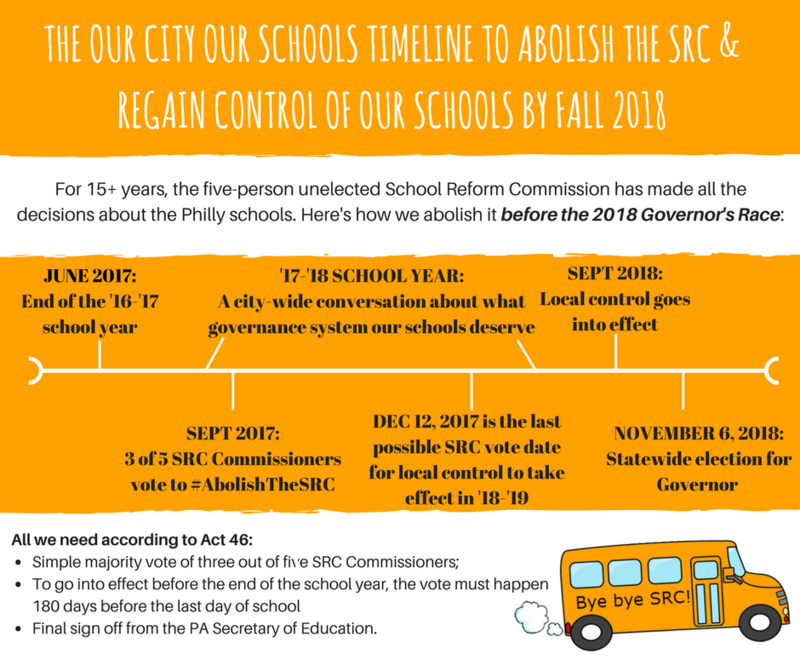 There are only two ways to abolish the SRC: a simple majority vote of SRC Commissioners with approval from the PA Secretary of Education OR the state legislature. With three new members of the SRC appointed by Mayor Kenney and Gov Wolf (both who have pledged support of local control), we have a historic opportunity to return our schools back to Philadelphians. According to Act 46 which set up the SRC, if the simple majority vote to abolish occurs before 180 days of the end of the school year, it will take another calendar year to transition the schools back to local control. In the Fall of 2018, we have a Governors race. Under Betsy DeVos, Under Trump, we cannot risk having the state controlling our schools with a Republican Gov. That’s why we need the vote to abolish to happen by Dec 2017 at the very latest. We are demanding that SRC Commissioners vote to abolish the SRC by the Fall of 2017, which will then leave us the entire 2017-2018 school year to have a city-wide conversation about what sort of school governance structure our schools deserve. This will ensure that local control takes effect by Sept 2018, just in time for the Governor’s race.